From Titan Entertainment. 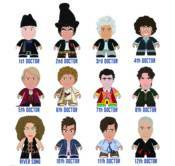 The Doctor Who Titans Regeneration Collection is a line of collectible mini-figures that depict the Doctor, as well as his wife, River Song, as they appeared in their first episode or immediately post-regeneration! From the second Doctor in his stovepipe hat to the tenth Doctor in his pajamas, the fifth Doctor in the bohemian red coat and jacket to the eleventh Doctor in the striped pants and tie, these collectible figures celebrate the entire history of Doctor Who!